A special cattle exhibition to promote Umbalacherry cattle breed, seen as the pride of Tamil Nadu, was organised here on its home turf in Umbalacherry in Thalainayar on Saturday. The draught cattle, known for its sturdiness, agility in marshy soil, and ability for long hours of labour, were widely seen as disease-resistant and farm-friendly in clayey areas of the delta. Here at Umbalacherry, each household owns not less than two cows. The exhibition was held with the objective of protecting the draught cattle from turning extinct and to urge farmers to take to Umbalacerry cattle breeding. 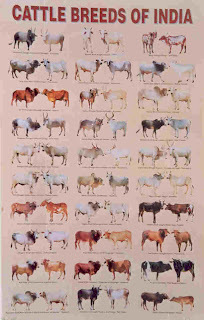 The cattle with morphological features of white stockings; white diamond mark on the forehead and tufted tail end, mark it distinctly from the ordinary cattle. For the people of Umbalacherry, the breed is a boon in times of drought as grazed feed is enough for the animal to last through the day. The cow yields 2.5 litres of milk a day, without additional fodder supplements.